ABBOTSFORD – UFV employees have shown themselves to be a generous bunch in the past. This year’s Lifesaver campaign offers them the chance offer support to students once again. And it will start with a splash at this year’s Employee Welcome-Back Barbecue on Wed, Aug 26. An initiative of UFV’s Advancement office, the Lifesaver campaign gives employees a conduit to support emergency bursaries for UFV students. There are a variety of ways to donate: one-time gift, payroll deduction, or supporting special offers by Sodexo in the Cascade Café in Abbotsford and by the UFV Bookstore. Throughout the fall, you can support the campaign by purchasing special Lifesaver food items in the cafeteria, including cinnamon buns, grilled cheese sandwiches, and rotating items at each station. There will also be point-of-sale donation pledge forms available. The Bookstore will donate partial proceeds from hoodies and all proceeds from specially designed Lifesaver notebooks to the campaign, as well as funds obtained from a textbook recycling program. The goal for the Lifesaver campaign this year is $40,000, up from nearly $30,000 in 2014. Last year, the bursaries supported by the campaign helped more than 160 students. 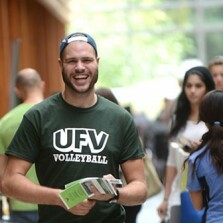 “Receiving the Faculty and Staff Bursary from UFV was instrumental in enabling me to complete my final term at UFV. Thank you for helping make this possible,” says a student recipient who plans on becoming a substance abuse counsellor. Reimer notes that one goal of the campaign this year is to increase the number of employees who give through regular payroll deductions. “It’s easy to sign up for payroll deduction, and it’s a convenient way to meet your philanthropic goals without having to get out your cheque book or credit card,” she says. If you would rather see your gift support a particular UFV scholarship or initiative, that can be arranged through the Lifesaver campaign as well. Director of Advancement David Leis notes that having a successful employee fundraising campaign also helps UFV make the case for supporting our university in the community. “If we can show potential donors that our employees believe in supporting our students through donations, that goes a long way in building additional community support,” he says. Remember to bring some cash along to the Employee Welcome Back Barbecue on Wed, Aug 26, so that you can support the cause by attempting to immerse your colleagues in the dunk tank! Chelsey Laird (International Ed), Al Wiseman (OReg), Egor Rappaport (ITS), Kyle Baillie (Student Life and Development), Mike Twolan (Emergency Management), and Kevin Poland (Sodexo) have all offered themselves up for dunking. Cost is $2 for one throw or $5 for three. The dunk tank is sponsored by Shawna Vandeven of The Cooperators – Vandeven Financial Solutions. Sodexo will also be offering candied salmon samples at the barbecue, by donation, with all proceeds going to the Lifesaver campaign. Reimer sends special thanks to Cameron Roy of Ancillary Services and Kevin Poland from Sodexo for working with her on creative ways to support the campaign.